According to A. Chubais, we traditionally believe that efficient use of fossil fuel, energy efficiency, and renewable energy are the major ways to reduce emissions. Rosnano actively invests in these three spheres. At the same time, the role of material improvement has been so far underestimated. Rosnano already has under way 106 projects including 65 manufacturing facilities and engineering centers in 31 regions. 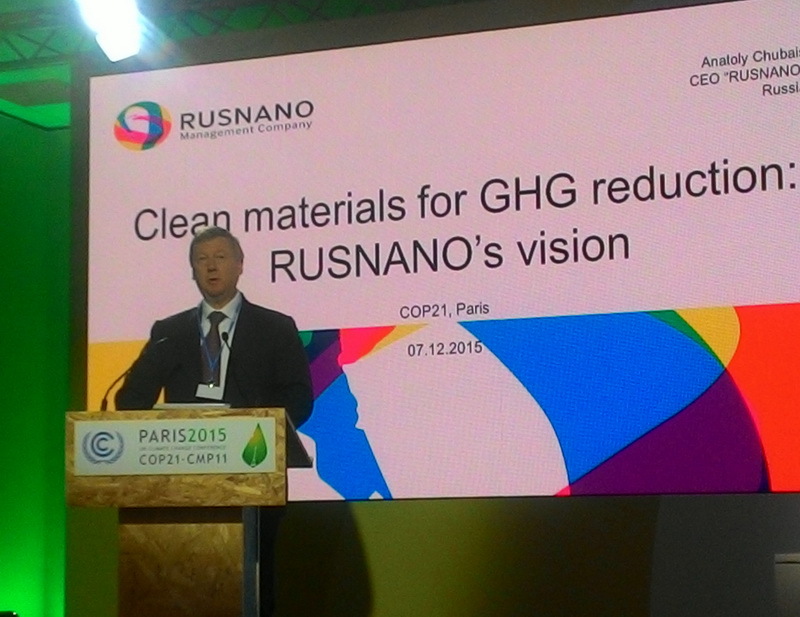 By Rosnano’s estimates, 26 projects (which are 25 % of all projects) will already have contributed to annual emission reduction of up to 160 mln tons of СО2 equivalent. Russian specialists have created the technology of single-shell carbon nanotubes which is a lot less expensive as compared to previous samples. The new technologies based on nanotubes addition to the materials noticeably enhance strength of so-called “basic” construction materials, i.e., metals, plastics, cements. Construction of buildings will require half of the amount of materials, while the service terms for the materials will noticeably increase. This will indirectly lead to decrease of resource and energy consumption and reduction of greenhouse gas emissions. A. Chubais presented comparative data on investments and subsidies required for the development of RESs, energy efficiency and new materials based on the development of single-layer nanotubes (based on CEE materials). It shows that for provision of 22% reduction of greenhouse gas emissions, it is necessary to invest $100 bln (to compare with investments of $ 6,000 bln in RESs and $1,800 in energy efficiency). No subsidies are necessary at all because this is a commercially attractive business. By information from Alexander Barkhatov, Rosnano Communications Director, more than 200 kilos of such tubes have already been produced and a production line for one ton per year will soon be commissioned, and a line for 50 ton tubes per year is planned. Such production does not require vast spaces, nor major equipment and logistic capacities; the product is a powder to be added to materials which (under the temperature no higher than 900̊ Centigrade) can cardinally improve materials’ properties. Bridges, roads, piers, and even ordinary tiers may become lighter and stronger. By 2030, the total reduction of emissions in RF at the account of this technology might reach 1.5 bln tons of СО2 equivalent. O. Senova, RSEU Climate Secretariat, asked A. Chubais about his opinion on how the prospects to acquire strong long-lasting materials might correspond with the global over-consumption trend and frequent replacements of personal items, computers, and vehicles, where not everything is defined with the material reliability. In A. Chubais’s opinion, this is a matter of competition and possibly might not work out in all industries. Nevertheless, while one third of world’s emissions are related with material production, this looks like a true chance for Russia. While our technology is cheaper than that of others, this should allow to promote this product at the global level. 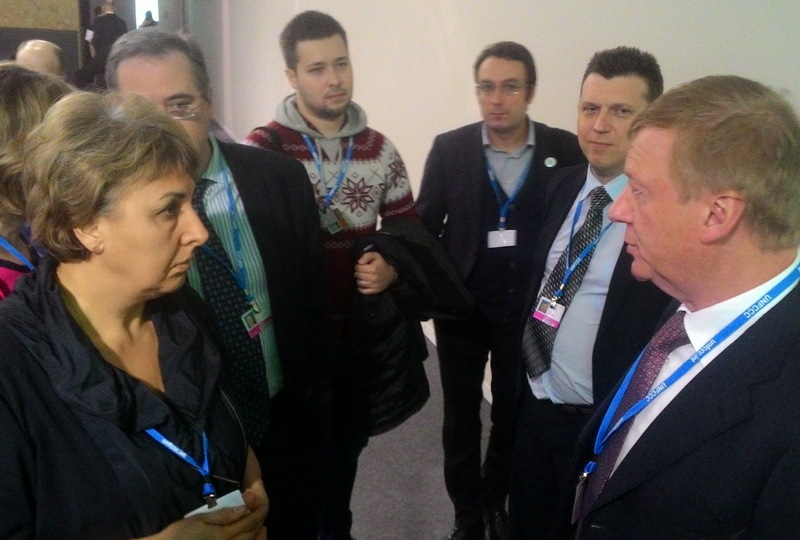 In A. Chubais’s opinion, the situation he had described shows that “clean materials” might make the base for changing the paradigm of climate actions. The challenge here is to make the new Global climate agreement legally binding; then, each country, each company will be interested in such technologies and they will be on high demand. Hopefully, going overboard about the “magical” nanotubes will not have replaced efforts on the development of clean energy, i.e., RESs and energy efficiency (where 78% of our emission reduction potential is accumulated and where we are apparently behind the world indexes) and the “clean materials” could have helped to bring these directions up to a new technological level.